A food designation law protects the names of wines, cheeses, meats, produce, grains, fish, olive oils, Balsamic vinegar and even regional breads. The purpose of the law is to protect the reputation of the regional foods, promote rural and agricultural activity, and help producers obtain a premium price for their authentic products. The designations also help eliminate the unfair competition and misleading of consumers by non-genuine products, which may be of inferior quality or of different flavor. Below are the four main food designations that the local foods of the TEA National Park have obtained. The acronym PAT, (Prodotti Agroalimentari Tradizionali) "Traditional Food Products", indicates products whose methods of processing, storage and maturation have been consolidated in time. These products must be grown and handled with in accordance of the Ministerial Decree, which dates back to July 18, 2000. All operations must follow the guidelines of the traditional rules, extended in time, for a period which is not less than 25 years. Most PAT products fall within the food categories such as bread, pasta and biscuits, and then fresh and processed vegetables, salami, ham, fresh and cured meat (and products of animal origin), cheese, non-alcoholic beverages, liqueurs and spirits. Denominazione d'Origine Protetta or "Protected Designation of Origin", like PGI, requires specific production and processing techniques for each product. However, unlike the IGP, in order to qualify for the PDO, each step of the production must be executed in the region of origin. There are extremely strict specifications that must be met in each step of production, which are then examined by experts to ensure quality. 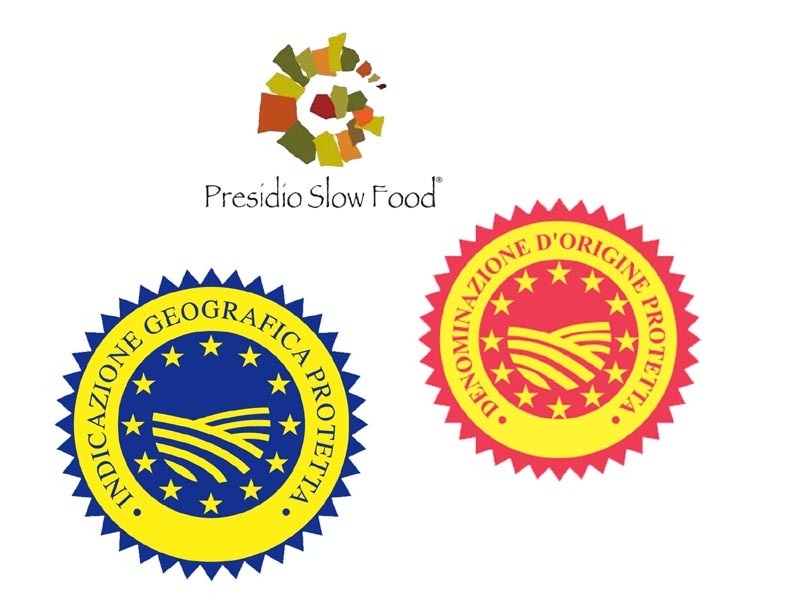 The PGI (Indicazione Geografica Protetta) or the "Protected Geographical Information," is the slightly less strict of the two denominations, which awards the PGI seal to products from specific regions of Europe. This designation guarantees that the product and the quality of the product, can be traced back to its geographical origin. At least one production and/or processing phase must take place in the designated origin of production for the product to qualify. The Presidia are projects established to save artisanal food products, native animal breeds, plant varieties, traditional farming and fishing techniques, ecosystems and rural landscapes at risk of extinction. They involve communities of small-scale producers who are willing to collaborate and jointly establish production rules and ways of promoting their product. They preserve ancient knowledge, encourage sustainable practices. The Presidia are concrete and virtuous examples of sustainable agriculture, based on quality, animal welfare, sustainability, a connection to a local area and consumer health and pleasure which are the result of 10 years of work that has reinforced their fundamental values. Those values are protecting biodiversity, territories and the knowledge of traditional productions. The values are expressed in their efforts to encourage producers to adopt clean and sustainable practices.